165 miles(ish) down and it’s great to be here in Fontana – the last few days really have been both a physical and emotional roller-coaster. Having stopped briefly in Franklin to resupply and celebrate St.Patrick’s Day in true American style, we headed out early on Monday morning rejuvenated and ready to tackle the next section of the trail – little did we know how difficult that would be! 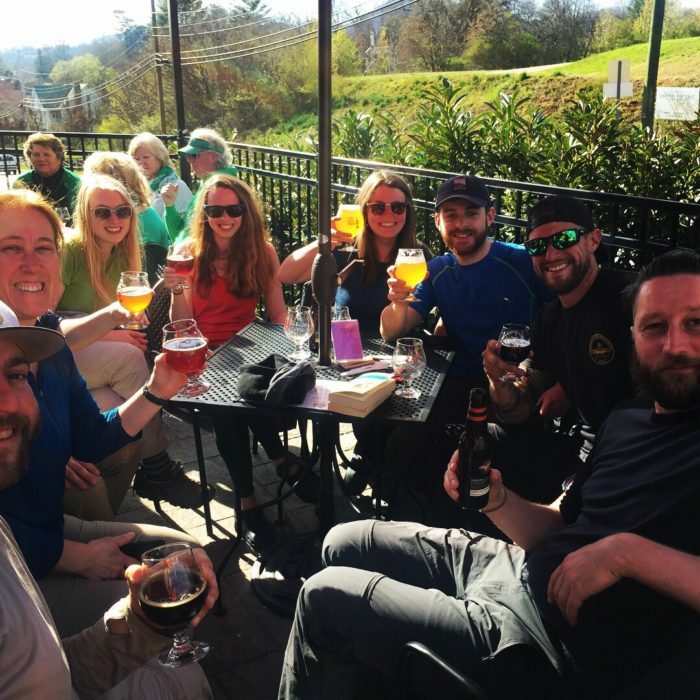 A bunch of us thru-hikers enjoying a brew in the sun in honor of the Irish. We started the week with glorious sunshine and a mood to match, the terrain was easy enough, and we were just enjoying the feeling of walking in the sun after such a cold start (so much so that Robin got a terrible T-shirt tan, but she’s wearing that thing with pride). It wasn’t long however until we started our descent into Nantahala (translates to the Valley of the Noon Day Sun, an accurate description as it’s such a narrow, deep valley that that’s the only time the sun can be seen), and the weather started to turn. We walked our longest day to date, walking a little over 14 miles, which included a four-mile downhill that dropped us 2,000 feet in fog and rain, and as you can imagine the mood reflected. Although the views were breathtaking the journey did take a toll on the knees. Thankfully we got to camp and set the tent up just before the thunder and torrential rain started. Our trail friend Squid Kid peeking out from his tent in a momentary break from the rain. 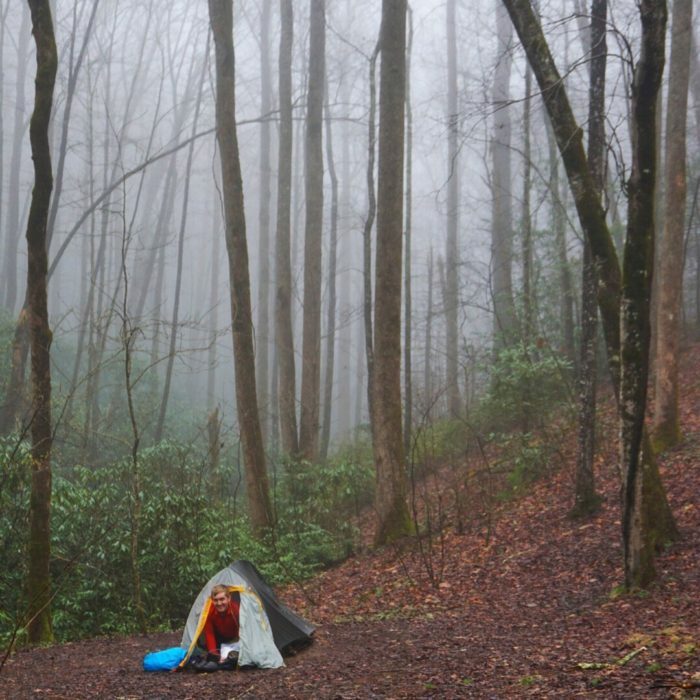 We woke up the next morning a bit stiff, but looking forward to resupplying from the Nantahala Outdoor Center (NOC) a mile ahead. We got there before the general store had opened, so had to wait awhile, but once it did we found the shelves almost bare. We’d really counted on that resupply point, but at least we only had two days of hiking to get to Fontana Dam. We still had some food, and got what else we could from the NOC before continuing 11 miles on to the Locust Cove campground. Eight of those miles included a continuous ascent rising 3,330 feet. It was an awful lot of up for one day. Having spent most of the day focusing on finishing the long climb, the final three miles to camp seemed to take forever. We thought the hard work was supposed to be over when we reached the top. When we got to Locust Cove we found our trail friends Hedwig and Squid Kid already there. Squid Kid’s tent was hanging upside down from a nearby tree, which isn’t exactly how he normally sets it up. He assured us all was fine and he was just draining some water out that got in during last night’s rain. Hedwig’s tent was up in the conventional manner, which guaranteed she’d been there for at least eight seconds. Nobody puts a tent up as fast as her. The rain came again right before we had to head out to hang the bear bag and swiftly turned to hail. The branch I was aiming for was high, and there wasn’t much choice around, which meant I missed a lot. Things got pretty grim, pretty quickly. I was on a steep slope, trying the throw my line higher than clearly I can, with my para cord frequently getting caught up in the foliage around me. Cold hail drummed down on my raincoat’s hood and soon I could feel cold water running down my back and legs. Throw after throw sailed under the limb but finally I hit the mark. To save Squid the same ordeal, we both hung our food off the line I’d just thrown. Back in the tent the drumming on the canvas above lasted most of the night, but by morning sounded much softer. We peeked out to find a landscape blanketed in snow. At home it would be a wonderful sight, but in the backcountry reality is different. We’re now very efficient at packing up the tent in the snow or rain, having worked out a way to collapse and pack the inner compartment while leaving the waterproof outer layer still up. That way we can keep the sleeping area dry. The truth is, though, the pegs are still frozen into the ground, the tent poles are still frozen together, and the clips that attach the sleeping compartment to the waterproof outer are still frozen solid. Our hands are quickly also frozen. If you try to get the tent packed away wearing gloves, you just lose all dexterity and the whole process becomes cumbersome and takes much longer. All you can do is work as hard as you can through the elements and get the job done as quickly as you can. At least then you can sling your pack over your shoulders and start walking, knowing the first uphill will warm you up again. The night before we’d looked at the terrain ahead and had thought it looked fairly innocuous. We were targeting a fairly standard 12-miler, to give us a short walk into Fontana the next day. We got underway with the snow still coming down, a cold wind gusting in our faces. Heading across a ridgeline the swirling wind would whip the snow around us, driving in from both sides as the gusts alternated direction. All we could do was keep going. We carried on to what we now know is called Jacob’s Ladder. The night before it hadn’t looked much, but it wasn’t long until it felt to us like the hardest climb of the AT so far. This thing just goes up relentlessly. There isn’t really much in the way of switchbacks to lessen the gradient, just small bends in the path that once rounded unveil a new view of seemingly endless up. The snow was getting deeper underfoot and I was starting to feel exhausted, with no sign of the real top in sight. I realized I’d started dragging my hiking poles and lost my footing a couple of times. I knew they were signs I was really struggling. For the first time on the adventure I had my first big mental challenge. I was feeling weak and beaten and my mind started going to dark places. I knew we’d face mental challenges on this hike, and there would be times we’d find things tough, but I hadn’t expected it to come so soon. I pushed on but eventually stopped and sat down in the snow. As I sat there, steadily my black waterproof coat and trousers started to turn white from the snow. I knew I was making a mistake and had to get myself up and moving, but instead I sat there a bit longer. The cold started to set in and there were no choices left. I had to get up and go or bad things could start happening. Eventually we reached a shelter, five miles into our 12-mile day. I was done. Mentally I was drained and I knew going on would be a mistake, so I told Robin I had to call it and stop for the day. Half an hour after we arrived at the shelter it was full with other hikers getting out of the blizzard. They came with stories of seeing other hikers hitching rides into town as well as hikers quitting altogether and heading home. I know there are probably a lot of people who would look at this and say I should have just manned up and carried on or that I’m weak for having that challenge in the first place, but I really don’t care about their view on this. Every hiker is going to face challenging times and question what they’re doing. 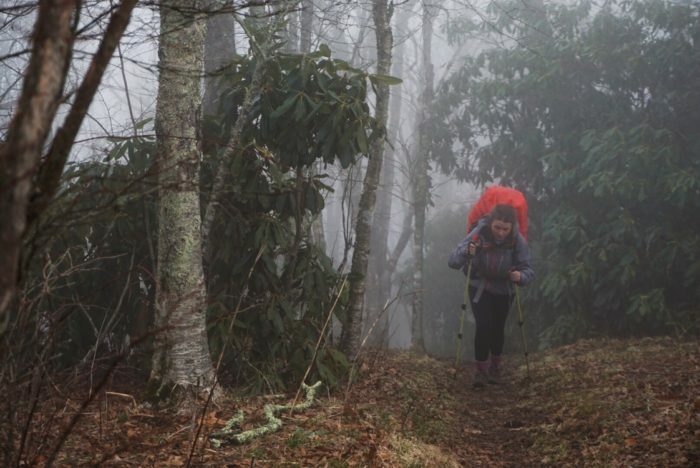 It happens so much that 75 percent of potential thru-hikers on the AT each year fail. What we’re trying to do is hard. What’s important is how you respond. Do you hike to the road and find a ride home, or do you rally yourself and find a way through? That applies to so much more than long distance hiking too. Tomorrow we’ll head into the Smokey Mountains, the end of which marks the point where in the last two years 50 percent of hikers have quit. We are entirely unwilling to be part of that statistic. If being honest with yourself and cutting your day short to have the time to refocus is what it takes to help you reach your goal, then being bullheaded is stupid and will cost you in the long run. The next day was a 180-degree turn. The blizzard from the day before had stopped and the winter hellhole had become a winter wonderland. We hiked out through areas that were more than a foot deep in snow and while it was hard work, it was beautiful. What a difference a day makes. We walked 13 miles to Fontana and got a room for the night. The restaurant has $2 beers and a burger on the menu. Sometimes there is nothing more you can ask for. Tomorrow we go into the Smokies knowing there’s a 90 percent chance of rain every day for the next week, that the rain might turn to snow, and there’s already a good layer of snow up there waiting for us. It doesn’t matter. We’ve faced it before and come through. We’ll come through again. Hello! We're Sian and Dave/Dave and Sian and writing this is made infinitely more difficult with Hendricks the cat sat on my hands! We'll be thru-hiking the Appalachian Trail starting March 2018 and we can't wait. We'll probably write some of our blog posts together and some separately, but either way our hope is to give a first-hand view of all the ups and downs of our adventure. Fingers crossed for ups! We really enjoyed this – I read the more interesting blog posts out loud to my husband. Someday, we will be in your shoes (I hope) but then its good to know how truly difficult it can be out there. If it was easy, everyone would do it, right? Hang in there and stay tough. We’re rooting for you!